John Thomas Gordon Hildreth in custody whilst leaving Aberdeen Sheriff Court. A north-east man has admitted a brutal assault on his brother in their home. Staff at the Sainsburys in Berryden became alarmed when John Hildreth started shouting that he had killed his sibling on September 3 this year. Police were called and he said to them he had kicked his brother but he was not moving. After interviewing him officers attended at his home on Bedford Road where they found Francis Hildreth severely injured and covered in blood and he was taken to hospital for treatment. His brother confessed to assault to permanent impairment and danger of life when he appeared in Aberdeen Sheriff Court yesterday. 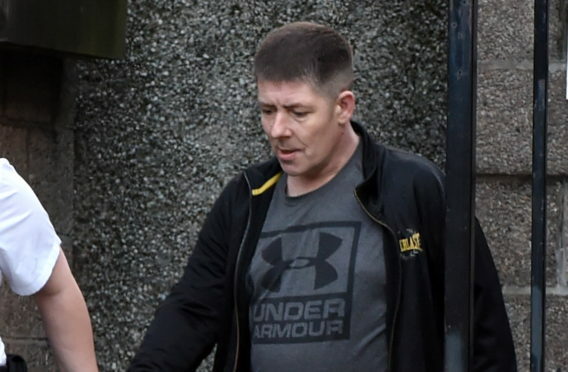 Fiscal depute Jamie Dunbar said Hildreth’s victim would be left with “permanent numbness in his lower lip” and “permanent scarring” on his mouth as a result of the attack. He added that forensic examinations indicated he had been kicked and punched while on the ground. Representing the 46-year-old, defence lawyer Graeme Murray said his brother had written to him saying he harboured no animosity for the attack. Sheriff William Summers deferred sentence in order to obtain reports. The prisoner of HMP Grampian will return to court in January.